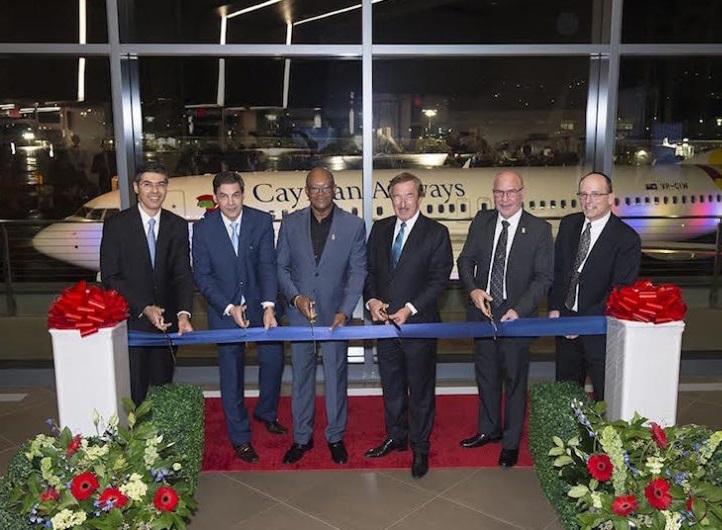 Boeing and Air Lease Corp. today delivered the first 737 MAX 8 for Cayman Airways. The first 737 MAX to enter service in the Caribbean marks the beginning of the airline’s plans to modernize its fleet and expand its network. Cayman Airways plans to take delivery of four MAX 8 airplanes to replace its fleet of 737 Classics. Compared to the 737-300, the MAX 8 offers 30 percent greater seat capacity, and a more than 30 percent improvement in fuel efficiency per seat. The MAX achieves the higher levels of performance with the latest technology CFM International LEAP-1B engines, Advanced Technology winglets, and other airframe enhancements. To prepare for their new 737 MAX, Cayman Airways will train pilots at Boeing Global Services’ Miami training campus. Under this agreement, Cayman will use Boeing simulators for its entire 737 fleet including 737 Classics and Next-Generation 737s. The 737 MAX family is the fastest-selling airplane in Boeing history, accumulating about 4,800 orders from more than 100 customers worldwide. Boeing has delivered more than 200 737 MAX airplanes since May 2017.